Pickup groups allow users to intercept calls directed towards other users of the group. This is done either by dialing a special extension or by pressing a function key. Pickup groups can be created in the Services ‣ IPBX ‣ Call management ‣ Call pickups page. In the general tab, you can define a name and a description for the pickup group. 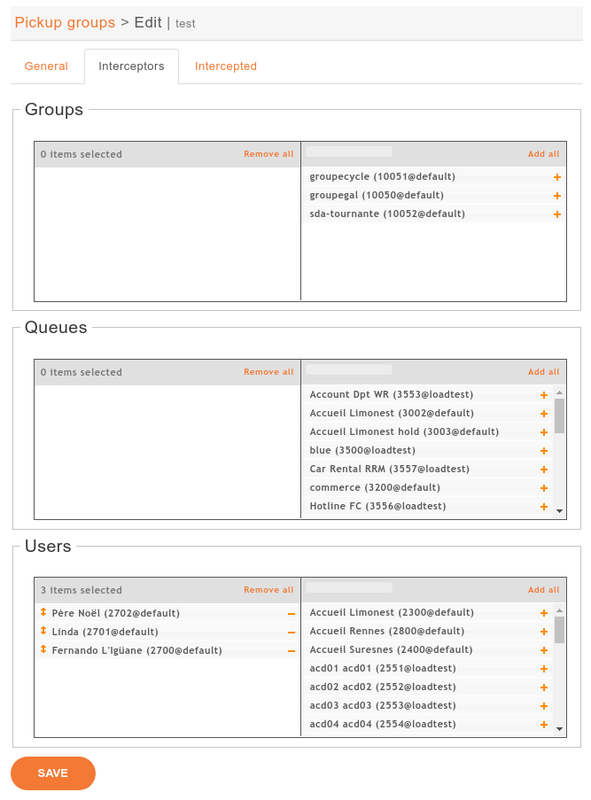 In the Interceptors tab, you can define a list of users, groups or queues that can intercept calls. In the Intercepted tab, you can define a list of users, groups or queues that can be intercepted. The pickup extension can be defined in the Services ‣ IPBX ‣ IPBX services ‣ Extensions page. The extension used by group pickup is called Group interception it’s default value is *8. The extension must be enabled even if a function key is used. To assign a function to an interceptor, go to Services ‣ IPBX ‣ IPBX settings ‣ Users, edit an interceptor and go to the Func Keys tab. Add a new function key of type Group Interception and save.